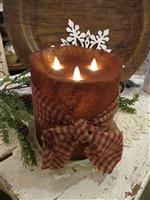 Regular & Primitive Realistic Battery Operated Flameless Candles! When turned on they are so realistic it is unbelievable! 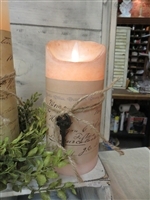 The LED illuminated plastic flame moves and dances around in a very natural way. Pictures do not do them justice. They are mesmerizing! 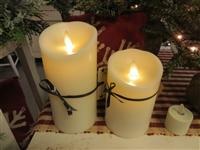 A safe alternative for homes with children & animals, the elderly, allergies, the outdoors or hard to reach places. They are AA battery operated, have an on/off switch & automatic daily timer for on 5 hours and off 19 hours. They feel real too, but they do not smell. 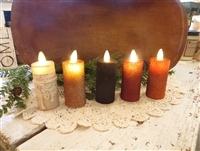 All of these candles have an etched texture except the Red, Ivory & Green... they are smooth. The Primitive ones come Prim/Cinnamon and they do have a light smell. 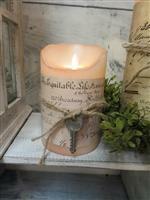 If you are wanting to order 3 or more candles please call your order into us so we can give you a break on the shipping !